Click on the image below to go to Jessops Facebook Page. 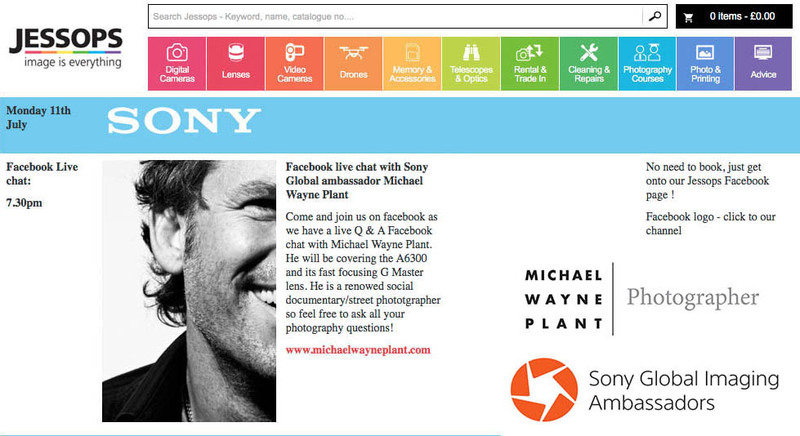 Michael Wayne Plant, is doing a live Q&A at Jessop’s on the Monday 11th of July at 7:30pm. I will be at the Jessops Oxford Street Store for the love Q&A session. I will be discussing aspects of photography and the use of the Sony’s a6300 camera and Sony G-Master e-mount lens. I have been using the RX1RII and the a7Rmk2 a lot lately and find that a smaller less professional camera has advantages, for the kind of images that I make. This is where the a6300 comes in handy. I am excited to be doing this, as I have not done a Live online Q&A before. While, I have been teaching photography part-time, since 2009 and have answered lots of questions it is exciting to do something a little different.